3D printed mini spectrometer and absorption cell holder with LED. 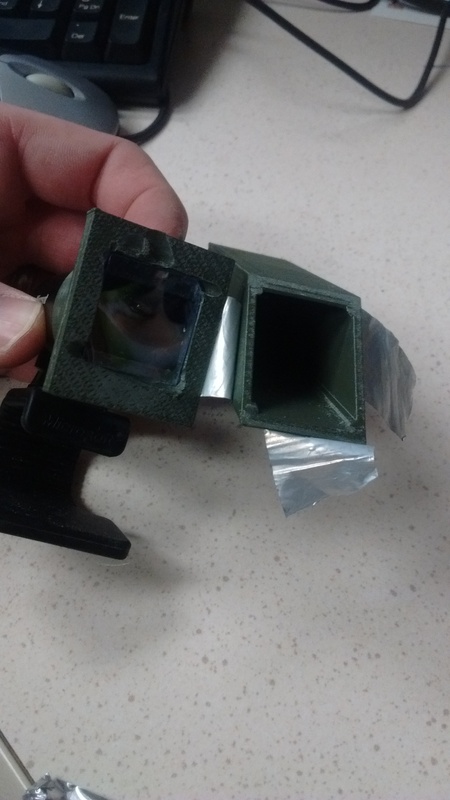 I took the basic design of the simple paper spectrometer and created a 3D printable version. The design is intended to interface with a Microsoft HD webcam. There are two parts - the cam interface and grating holder and the spectrometer body with the slit. This version of the spectrometer is printed using PLA filament. After initial alignment and testing the two parts are attached together using superglue (plastic is the ideal material for superglue, it bonds the parts together). The .stl files attached fix the need for any grinding like I did here to get the grating to fit (it originally was supposed to slide in from the side, but the tight fit scratches the holographic grating off the DVD piece. I highly recommend the metallic duct tape or a good quality electrical tape for attaching anything that needs to be light tight. You could also take some flat black spray paint to the inside of the spectrometer body to reduce straylight. For the absorption cell body, the spectrometer is a tight fit with the slit lined up vertically. An LED or LED array fits in the end (the is formed for the large style LED (not shown)). 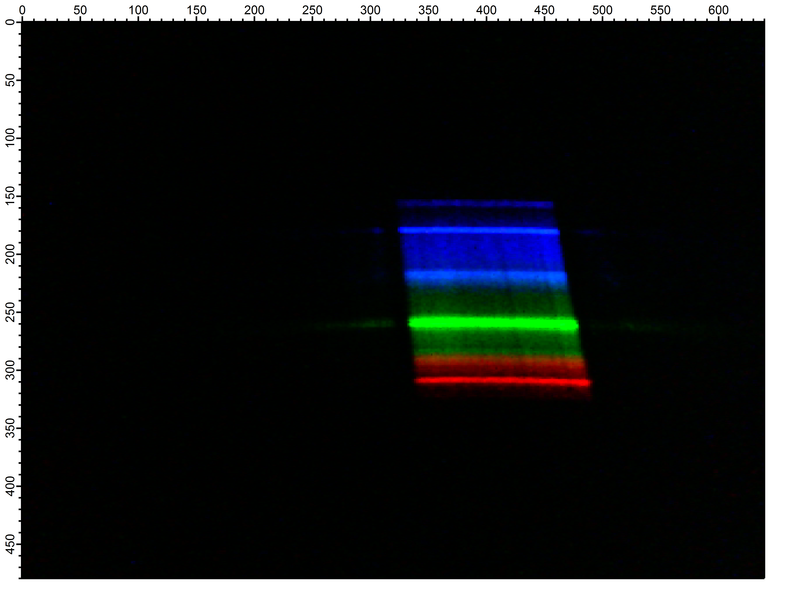 Use a piece of note card or cardstock as a diffuser so that you don't get lots of stray light in the spectrometer and can get a more uniform illumination of the slit. A standard 1cm liquid cuvette should fit in the square slot for absorption measurements. 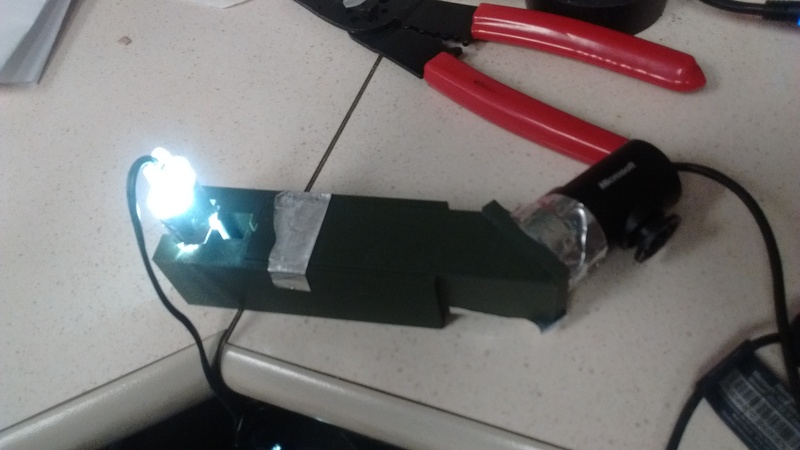 I approached this project because I wanted a fairly simple absorption cell that I could control the timing and focus of the camera better as well as have a reproducible placement of the absorption cell (1 cm cuvette). 3D printing seemed like a good way to go about this. Enjoy! Very interested to see this, kudos! 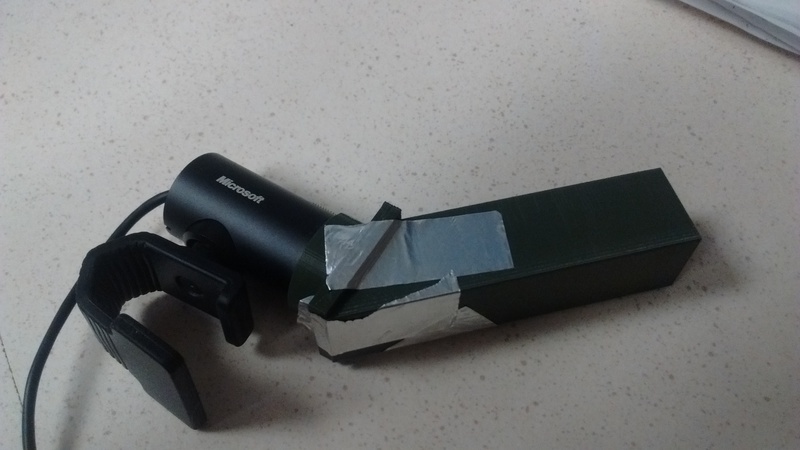 We've had some difficulties finding standard ways to disable exposure compensation on webcams, and there's been a lot of interest in using the Raspberry Pi cam to do fixed exposures. Any interest in trying that out? Warren, looking at your post (and specifically the size of the camera you are referring to, you could easily interface that by just attaching it to the end of the camera port in my design (I did something similar with one of my prototypes with an older webcam that I had removed from its case - I just taped it on). The Microsoft cam was a good one because it has a ruond body (and I have read about this camera being used with a telescope, so its optics are pretty good: http://dslrmodifications.com/lifecam/lifecam1.html). Yes, that sounds right. I think the remaining issue was that unfortunately it wasn't clear if the RPi camera can be accessed via the browser webcam API. But it seemed there were some ways forward on that. @stef Thanks for trying out my plans. I also found that the slit width that was printed was sub-optimal. I made a narrower slit with aluminum duct tape (the kind used for HVAC). I'm sorry about the cuvette hole size - I had increased it, but that depends on two factors (the exact size of your cuvette and the printing bead-width of the model of 3-D printer. 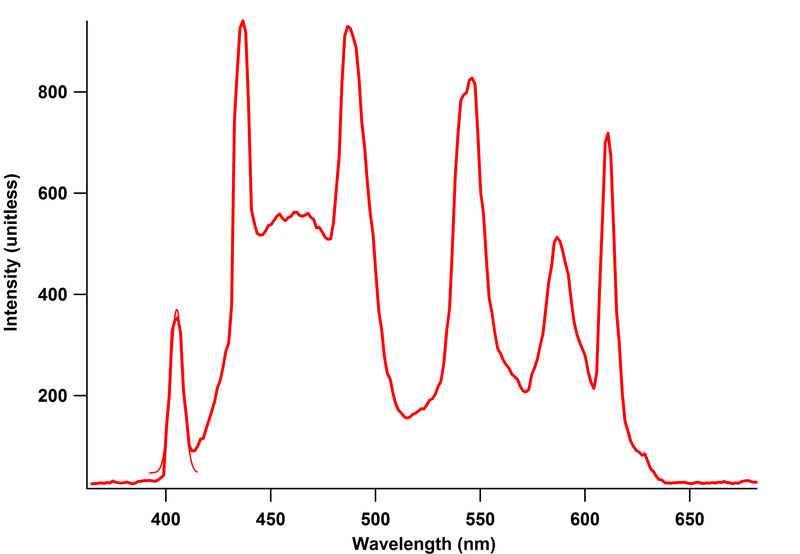 For my modified slit, I can get a spectral resolution of ~5nm FWHM. Did the camera not get as warm when you turn off the auto-focus? For the solar spectrum that you captured, is this a sky spectrum or looking at the sun? Also, there seems to be light in the UV (according to the spectrum scale) - I would assume that that is straylight, but I guess that the calibration may not be valid in that range? Again, thanks for trying out my plans! This is so exciting to see. @stef, would you be willing to post a response using the "Document your attempt to build this" button above the builds section above? @rthalman and @stef, how long do you think this took to make, and how difficult was it? There are some extra tags we can add to flesh out how this build is shown on the site. Also, is it possible to order this print on Shapeways, do you think? I'd love to get one but don't have a 3d printer. Anyone want to try uploading to to Shapeways and sharing a link I can order from? I'm happy to pay above cost if someone has experience setting it up. I want to try putting it into a sturdier enclosure and using a Raspberry Pi camera. @warren I have the .stl files in the description, you can upload those to Shapeways. In PLA on shapeways the absorption cell body costs $26; the Spectrometer Body runs $15 and the Camera Mount $9.47 for a total project cost of $50.91. I can't seem to find where to make a link to the object, but they all seem to load correctly and to size (scaling should be in inches when you upload). As for time, once I got the printed parts it took maybe 20-30 minutes to assemble, most of which was getting the grating installed and then aligning the camera and then once I was satisfied taking the super glue to attach the camera mount to the spectrometer body. @warren, @rthalman I will share the build details once I get some fotos. The public library operates on a cost recovery system so the cost of the project was about $12 cdn for all 3 pieces. I sent them the *.stl files and in a couple of days picked them up. The only fly in the ointment is the que to start. The webcam mod took most of the time. I would be interested in the paper version file as well. Do you think you could add the papercut silhouette version to this listing of mods to the kit? We'd love to feature it! Also see this one: https://publiclab.org/notes/briandegger/12-11-2015/silhouette-cut-public-lab-mobile-spectrometer-v2 -- though it's not too fleshed out! @stef @warren Also, the link for the cut file for the Cameo look similar to the one I made, so I won't post mine (I just digitized the pdf that the original fold-able paper one had).